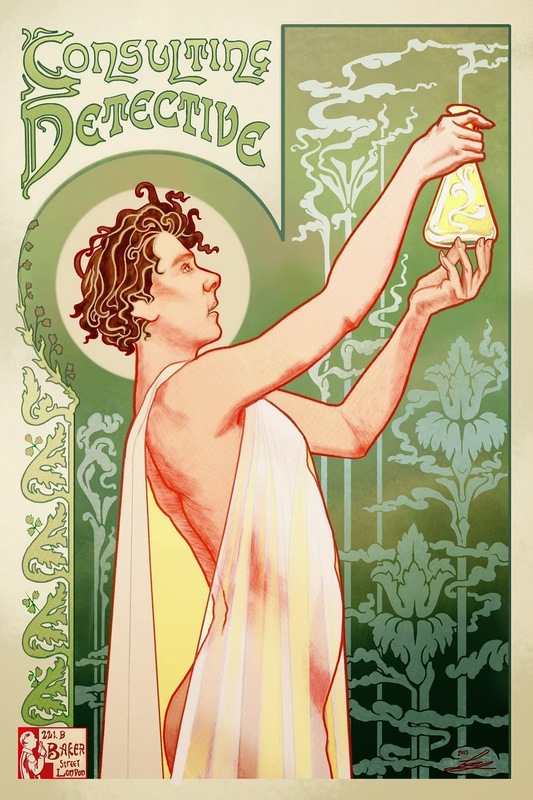 Absinthe Robette, painted by Belgium-born Henri Privat-Livemont, is one of the most iconic absinthe posters and the pin-up style of the original has attracted collectors, artists and absinthe lovers since 1896. The GIF above, created in 2014 by Challenger 23, is the latest, and it is interesting to see the bubbles in what was originally a classic absinthe serve with chilled water. Maybe Challenger 23 sees the Death in the Afternoon cocktail (absinthe and champagne) as a more suitable drink for the lady in the poster, and that works for me. 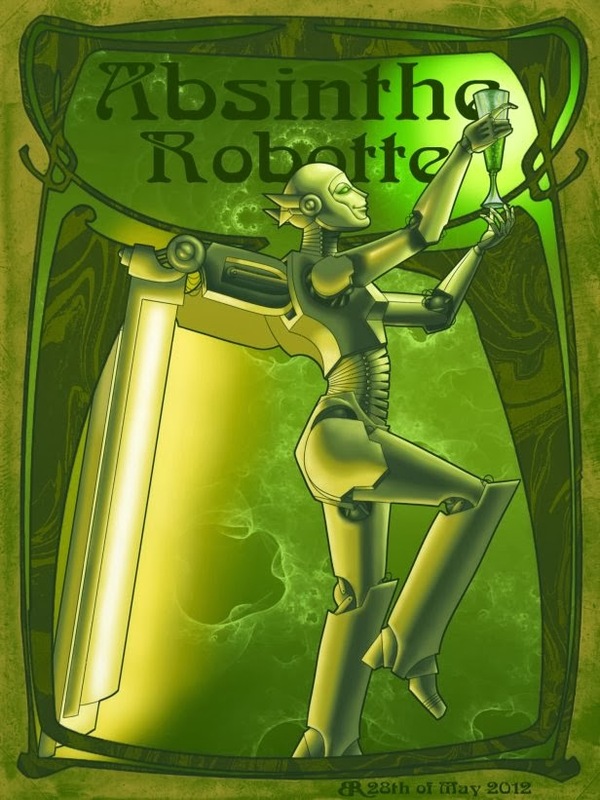 A practitioner of deviant art has cleverly re-worked the poster as "Absinthe Robotte." Even the Sherlock Holmes of Benedict Cumberbatch has been re-cast in the same posture, but I don't find this nearly as attractive! What of the absinthe itself? 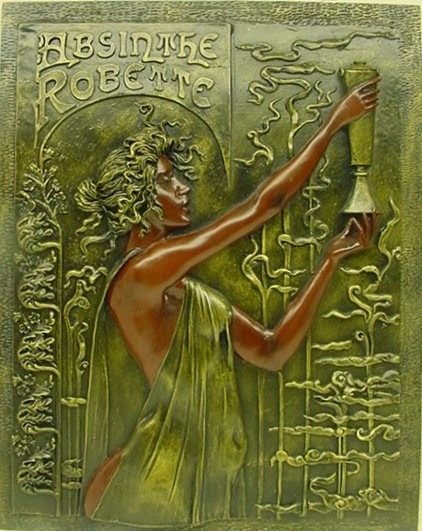 Well, according to Belgian blogger, Stijn Teijssen, Absinthe Robette was the trademark of the Distillerie Petitjean & Cie, founded in Mons, Belgium. This factory also produced fine kirsch, amer and mirabelle. It was the second establishment of Petitjean from Saint-Loup in the French department of Haute-Saône in the Franche-Comté region. This successful French distillery, led by Mr. Petitjean himself and in succession by his widow Mrs. Robette (hence the name of the Absinthe), counted 52 employees and an astounding 340 representatives in France, Belgium and possibly other countries as well. Sadly no-one alive today seems to have tasted this absinthe. However, the poster continues to attract artists in all fields and one of the best is the video below. I suggest slipping into something more comfortable, pouring a Death in the Afternoon or two, and enjoying the art and the drink together. Santé!